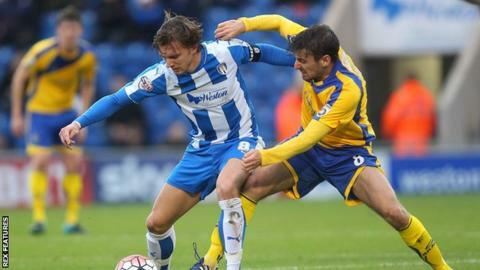 Colchester boss Kevin Keen has said "precious jewel" midfielder Alex Gilbey has Premier League potential. The 21-year-old has scored twice in 28 games this season, including against Fleetwood in League One on Tuesday. "Alex Gilbey is a precious jewel for this football club. In my opinion in two or three years he will be a Premier League player," Keen told BBC Essex. "He's one of the best players in the division and worth a hell of a lot of money to this football club." Keen continued: "He's learning very quickly, he's fantastic. He's not just a runner, he can score goals, tackle, win headers, he's a real jewel for this football club." Glbey has made 107 appearances for the U's in all competitions since graduating through their youth academy and helped Keen's side draw against fellow strugglers Fleetwood on Tuesday. The result lifted Colchester to 22nd in League One, five points from safety. "It's a point on the way to the 30 [more] points I think we needed, so we're down to 29," Keen said of the draw. "It's a big ask but I'm sure that once we get the one win we'll get underway."